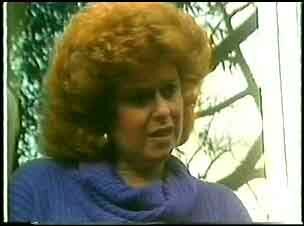 Daphne advises Terry to just give Charles the tape. 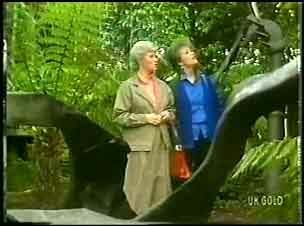 Daphne is horrified that Des is thinking of asking Sarah to stay on. 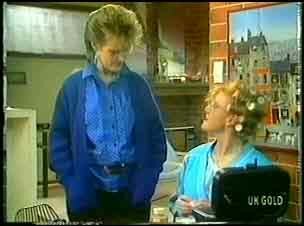 Daphne reckons that she's had enough of Sarah, but Des says she's being irrational. 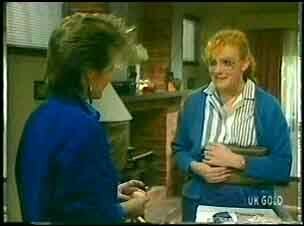 When Des has wandered off, Daphne calls Terry and asks her if she's given Charles the tape yet. Terry says that Charles won't just disappear and if the police get hold of the tape she'll be put in prison. TERRY: I can't tell you, I want to put all that behind me. I just want to have a normal life. Helen is sketching when Daphne pops round for a chat. She asks Helen for advice about steering a friend on to the right path. Helen says there's nothing you can do but to encourage them and then let them take their own decisions. Just then, Shane and Paul come in and distract Daphne, so Des goes over to talk to Sarah. He tries to wriggle out of her staying on at the house. Sarah is very offended and says she'll move out straight away. When Sarah has stalked off, Des asks an employee called Colin to take Sarah on a date(!) He isn't impressed! Paul has given Shane and Daphne a lift home. Daphne tells Shane that she's thinking of moving out and Shane suggests they move in together. Daphne says she wouldn't want to spoil a beautiful friendship! Julie is still waiting to see Phil. She writes down her number for the nurse to call her then finally takes her advice to go home and get some sleep. Julie has come in. Des asks her gently when she's thinking of coming back to work because he's doing the rosters. Julie says she doesn't know if she's going to come back at all. She has two children to think about now, just like Helen dropped everything to look after them. JULIE: He asked me to look after the children and that's what I'm going to do. DES: You really love him, don't you? Paul is listening to his Walkman (which sounds suspiciously like the Neighbours theme tune!) when there's a knock at the door. It's Julie. Terry has taken the kids out for the afternoon, so Paul sits her down for a shoulder massage. Julie apologises for encroaching on Paul's life but he says it's fine. PAUL: Julie, I want you to know something. I think you're a very special person with all you're doing. And I'm glad to be your borther. Sarah has calmed down slightly and stiffly asks Daphne for her egg-cosies. Daphne swallows a laugh and then tells Sarah that she doesn't want her to move out - all they have to do is not judge each other and try to change each other. SARAH: Do you think that would work? DAPHNE: Well, we could try. We could say it was our little contribution to World Peace. DAPHNE: Sarah...you didn't really have anywhere to go, did you? Sarah is explaining to Des that Daphne has asked her to stay on. Also that she's been asked out on a date. Des pretends to be surprised and advises her to wear her best gear and a bit of makeup! Daphne has brought a casserole over for Terry, Paul and the kids. In the kitchen, Terry tells Daphne that she thinks Charles has been pumping Scott for information about the family - chatting to him at the Coffee Shop as just another customer. The phone rings, waking Julie up on the sofa and Paul answers it. PAUL:(to Julie) Guess what? He's out of danger. He's going to be alright! In the kitchen, Terry tells Daphne that she has to get out of her own mess without Paul. Daphne agrees not to spill the beans. Daphne comes in and is surprised to see Sarah using her makeup box. Daphne gives her some quick beauty tips about makeup. Sarah freezes as Des comes in and runs off to her bedroom. DAPHNE: Well, I'll leave you to it, Des. I'm off for a much-needed dose of sanity! DES: Have one on me! He goes to the kitchen and laughes to see the egg-cosies back on the eggs. 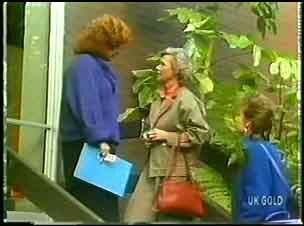 Daphne comes in to meet Helen, because they are going out. A car horn beeps outside and Sarah isn't happy. She sends Des out to tell Colin to come to the door like a proper gentleman! Daphne and Helen are looking around the place for Helen's art exhibition. The gardens are lovely. 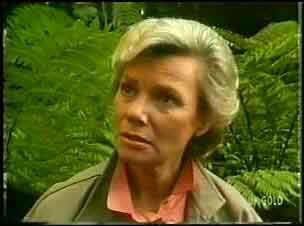 The owner of the gallery, Mrs Gibbs (Audrey) comes out and recognises Helen. She is a bit confused though - Douglas Blake came in at lunchtime to cancel her exhibition.